Happy New Year everyone! I’ve been too busy to blog lately, so I thought I’d bring everyone up to date with what’s been happening at the drawing board. Thanks to two great friends who had a lot of confidence in me, I complete my first two commission pieces in 2011. The first, Lola (see Blog Post titled “Commission Accomplished”) was done as a Christmas gift from a dear friend of mine for her hubby. 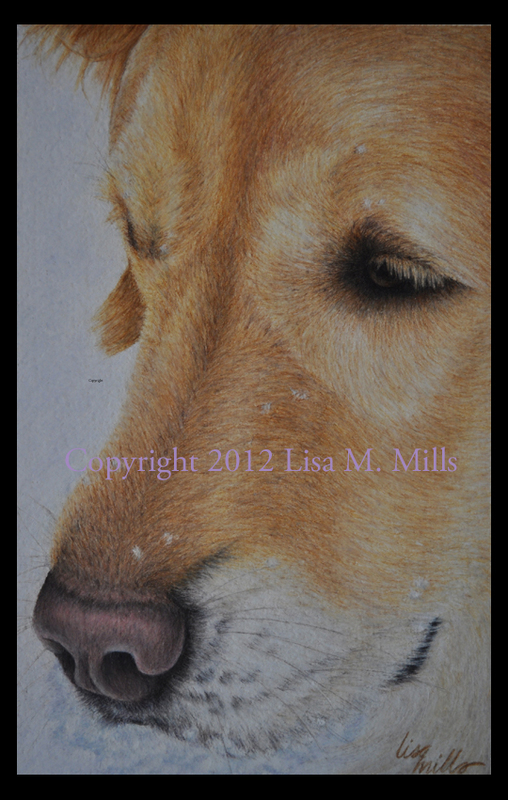 This posthumous portrait was of a beautiful and spirited Golden Retriever. The second piece was titled “Annie” (see below). 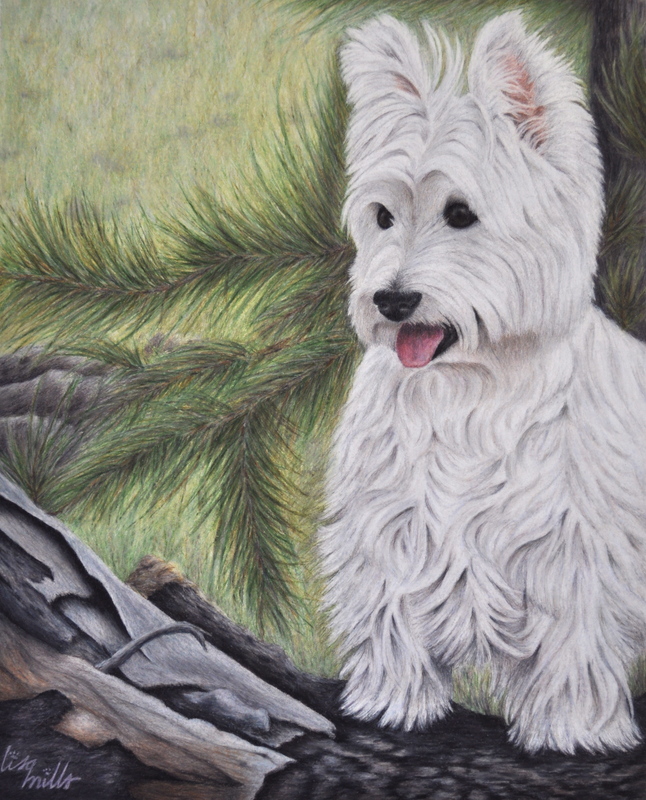 Annie is an adorable West Highland Terrier who is the pet of another dear friend’s mom. This too was a Christmas gift and boy, was I sweating it out Christmas Day knowing that the two gifts were being unveiled to their recipients that day! I love the new technique. It’s a lot more fun to execute and it has a real painterly feel to it, but with the media control of pencil. That’s all the time I’ve got for now…I will share with you soon the newest portrait of my dog Lucy playing in the snow. I delivered my first commission piece this morning! 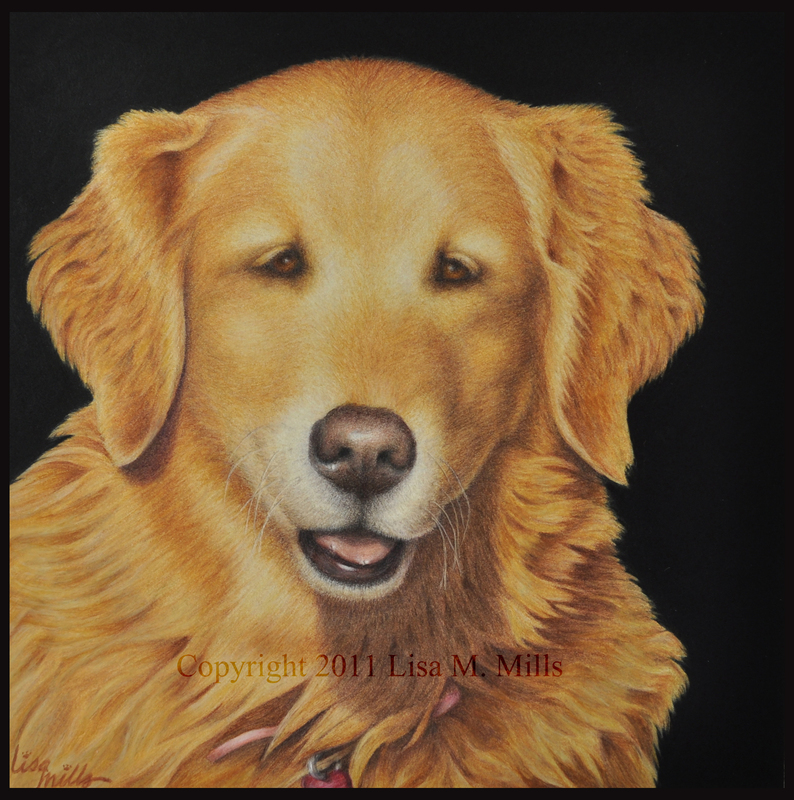 My client was a sweet friend from college whose family had lost their beloved Golden Retriever last year. The artwork will be a gift for her husband for Christmas. I wasn’t prepared for how nervous I’d be creating this piece for a client. My biggest goal in illustrating animals (and people, for that matter) is to capture their personality in their facial expressions. If I can’t recreate the expression, I have not succeeded…and that is just for my artwork, in general. Add in a paying client and I want to create the character in the animal and satisfy the client. It was a bit intimidating, to say the least. This piece took me about 3 – 4 weeks to complete. I was working from a photograph and the final piece was about 8 times larger than the photo. 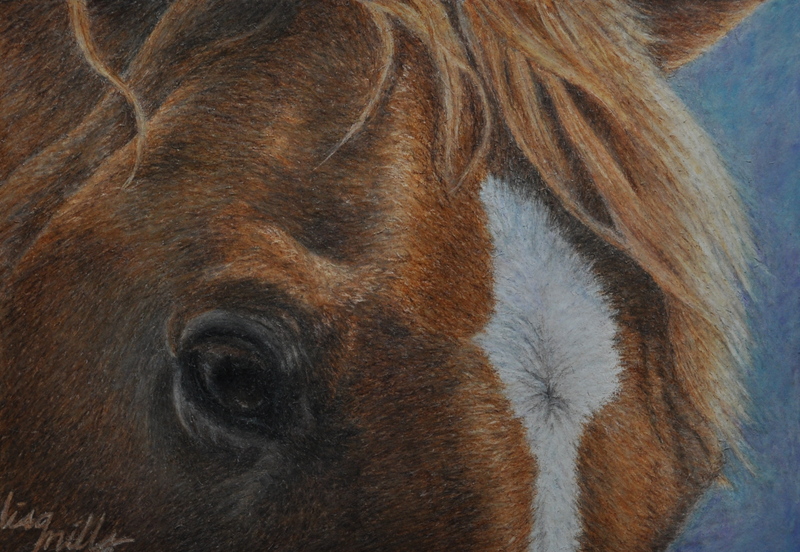 It is in colored pencil and oil and wax pastel on Stonehenge 300 gsm. paper. I met with my friend once before I got started to see exactly what she envisioned. I met with her again when the piece was mostly complete to “tweak” parts of the illustration that were not quite right. I texted several iPhone photos of the drawing while it was in progress. She was a beautiful dog and all of her photos showed what a great personality she had. I love the grin on her face! My friend was happy with the final product and for that I am grateful. As an artist however, I’m never 100% satisfied with anything I create. There is always room for improvement. I also feel like if I ever become completely happy with a piece, then I probably have become complacent. I look at each piece I do as a learning experience and I always hope to grow with each step. Thank you, my friend for trusting me with this beautiful girl! I can’t wait to see what your husband thinks on Christmas morning.